Old Mr T introduces the cars to what it really means when Jesus says 'Follow me,' by taking them on an adventure they won't forget. 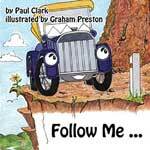 Car Park Parables is a series of Bible stories for kids told with cars in them. Paul Clark is married with two kids. He has nearly 20 years experience in children's and youth ministry having worked in both the city and rural areas in Australia. Paul has a knack for sharing the gospel message, simply and profoundly through story - something he is very passionate about.